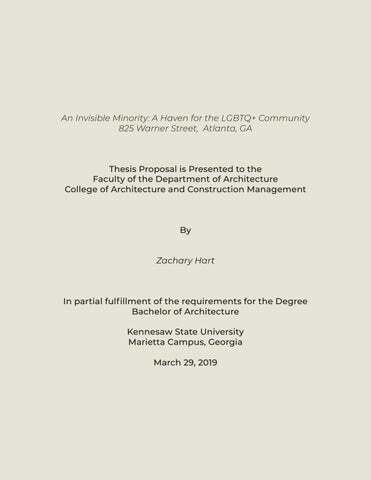 Thesis Statement Members of the LGBTQ+ community who are neglected and abused, homeless, or forced to feel uneasy in their own skin need an accessible haven in which they can be embraced and nurtured. Design Hypothesis To create a mixed use residential / commercial center that collaborates civil rights with architecture, creating a haven for struggling members of the LGBTQ+ community. The center would serve as a physical manifestation of acceptance, wellbeing, and understanding on LGBTQ+ civil rights and mental stability for the community to seek refuge in. To promote the these values, the structure will incorporate natural lighting, vegetation, texture, color, and a communal layout to behave as a secondary home for the LGBTQ+ community. Project Nature, Context, & Rationale This design should be sustainable: both in an architectural sense and a societal sense. The civil rights movement that pushes for equal rights of all humans is a growing one, and the journey will not end with the LGBTQ+ Community. The movement towards the future is one of acceptance â&#x20AC;&#x201C; this building needs to display that in every aspect. A floorplan that centers around central nodes will provide gathering spaces for various needs. These nodes will include spaces centered around homelessness, mental health, life skills, and outreach. may sound like a small percentage, but this number represents over 9 million Americans. 75 million youth in the world identify as lesbian, gay, bisexual, transgender, or queer. Depending on your country, the community you live in, and your immediate surroundings, the result of this unchanging fact varies from being punishable by death, to being abused physically or mentally. In a best-case scenario, it is treated as â&#x20AC;&#x153;acceptableâ&#x20AC;?. How can the millions of LGBTQ+ Youth in America juggle the judgment from their families, the ridicule from their peers, and the pressures of society to identify within gender normative roles? While these individuals develop into the adults they will later become, they need an escape from their harsh reality to see a brighter future for themselves. LGBTQ+ youth who are neglected and abused, homeless, or forced to feel uneasy in their own skin need an accessible haven in which they can be embraced and nurtured. situations, providing a physically safe space as well a space for growth and acceptance. This thesis aims to collaborate civil rights with architecture, creating a haven for struggling LGBTQ+ youth. I am proposing a shelter and education center that becomes a welcoming & comforting space for these youths to seek refuge in. The center would serve as a physical manifestation of acceptance, well-being, and understanding on LGBTQ+ civil rights and mental stability for the LGBT community. The center will incorporate natural lighting, vegetation, texture, color, and a communal layout to behave as a secondary home for LGBTQ+ Youth. We need to set an example in our nation as a precedent for ourselves, as well as developing countries. shed light on this community, bringing it out of the shadows and into the light. likely. LGBTQ+ youth are much more likely to be homeless as well. These statistics are a “result of hostility or abuse from the young people’s families leading to eviction or running away” In a community where diversity and misunderstood is feared and ridiculed, starting from an early age, LGBTQ+ minors are at the highest risk for these outcomes and often live in a prolonged state of fear because of it. “LGBT relations are illegal in 74 countries. In 72 countries, homosexuality is a criminal offense & in 12 countries homosexuality is punishable by death” (Siobhan). This unjust truth makes statistics on the LGBTQ+ community impossible to pin-point. The invisible nature of this minority makes it unique and masks the truths that come with it. expanding set of ideas, and with this comes a wide range of prejudices. People who identify as lesbian, gay, bisexual, transgender, queer, or intersex each deal with a different set of struggles. Each of these goes through an even more unique struggle both internally and otherwise. Racial minorities and transgender youth within this deal with added struggles, “only 11 percent of youth of color surveyed believe their racial or ethnic group is regarded positively in the U.S., and over 50 percent of trans and gender expansive youth said they can never use school restrooms that align with their gender identity” (Human Rights Campaign). those who feel unsafe from others physically and mentally. The LGBT community faces much higher risks in the face of abuse, and many are forced out of their homes to avoid the abuse, or kicked out and cut off from their parents, with no way to support themselves. A long term affordable housing solution can benefit these individuals, and a short term emergency housing can help save lives. reuse of an existing building, or a completely new construction. The symbolism behind it should be of a new era of civil rights and acceptance. Georgia is a state with one of the highest percentages of LGBT adults, but as a state is not known for being progressive. Atlanta therefore serves as the perfect place to host a center for these progressive issues. Adair Park, a neighborhood that is developing off of the Atlanta Beltline Westside Trail. The beltline is a perfect host for a progressive program such as this, that brings in a lot of traffic, and is accessible from a walking standpoint. The site slopes gradually, about 12â&#x20AC;&#x2122; across the span of the width at about 280â&#x20AC;&#x2122; wide. The large site has the potential for multiple courtyard spaces as well as utilizing space for communal gardens right off the beltline. people at my university who seemed different in a way that I could not quite put my finger on. They seemed accepting and caring, and had no partiality to race, gender, or sexual orientation. These people admired about character and personality. These people seemed to contradict what I thought the world was like: they were open minded, excited to learn about unfamiliar topics, and willing to hear what others had to say. I watched with a deep yearning from a distance as other students â&#x20AC;&#x153;came outâ&#x20AC;? as homosexual and were welcomed with open arms. I saw this happen handfuls of times, and even still it took two years for me to erase the writings of hatred that were written with permanent ink on my brain. With the help of this group I met, I was able to realize that although parts of the world were against me, I was surrounded by a part of the world that was not. 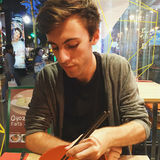 The relationships and sense of community I built helped me come to terms with who I was as a gay man, and persuaded me to let myself be accepted by the nonjudgmental community around me. first started school â&#x20AC;&#x201C; I saw these confident, skilled young adults, and never thought that I would be in their place. The students that are a part of my organization it guided me onto a path that I feel has set me up for greatness. It is through the platform my community provided for me that I was able to accept myself, and in turn, my homosexuality. leader, and as a professional through the community I built. The people I surrounded myself with allowed me to achieve things that I once thought were impossible because of my invisible minority. In the aftermath of this extraordinary experience, I can now construct what were once feelings of fear and repression into something completely new. I can channel these experiences into an outlet for advocacy. I am focusing my architectural thesis on a safe space for LGBTQ+ Youth who struggle with mental health issues, homelessness, and abuse. My goal for my thesis is to give LGBTQ+ Youth the same environment of inclusiveness and acceptance that I built for myself. A child in a similar situation to what I was going through needs a community in which they feel safe. A supportive community is vital in fostering repressed young minds gain confidence and acceptance within themselves, as I did when I came to college. Center for Civil & Human Rights The Center for Civil and Human Rights by HOK + The Freelon Group is a project with the idea of a Space for Action behind it. The concept derived from historic urban environments that housed major civil rights movements and events, including the National Mall in Washington D.C., Tiananmen Square in Beijing, and Tahrir Square in Cairo. The building sits in a prominent green plaza in a tourist-filled area of Atlanta, adjacent to the World of Coca Cola and the Georgia Aquarium. The form is composed of two elegant and firm curving walls that define space the in-between space. The projectâ&#x20AC;&#x2122;s program is meant to empower individuals that come between the two walls. The walls are panelized in shades of brown earth, and the roof functions as a green roof. This exhibit reminds us that we all come from the same place. Inside the walls, a monumental staircase connects these levels together, each housing a different gallery space. On the east side of the walls, deep windows are punched out, letting light penetrate into the exhibits interior. As you are spilled out to exit on the lower level, you approach a glass and steel water feature that symbolically celebrates civil and human rights. LGBT Center Renovation This LGBT Center Renovation by FranĂ§oise Bollack Architects was completed in 2001, and is located in a Historic District in Greenwich Village in New York City. This in itself is a contradiction; the idea of a space where the LGBT community can be open and accepted is a completely new idea, and to place it in a historic, mid 19th century school building serves as a statement to society in and of itself. The organization that occupies the space is a non-profit organization that provides offices, meetings, as well a serve as a social space to gay, lesbian, bisexual, and transgender persons. The buildingâ&#x20AC;&#x2122;s adaptive reuse was started in 1985, and the street front faĂ§ade was renovated later in 1991. Because the building is historic, a new building core was needed, increasing the usable square footage for the center as an added bonus. At the new core, a monumental 3 store staircase was added, seeming to float up towards a light from a large skylight directly overhead. The hallways each end in a bright glass curtain wall, bringing light into the space and views for the visitors. As a reminder to the history around the building, parts of the walls are exposed original masonry, which directly juxtaposes these new glass and steel interventions. This both celebrates the buildings history, as well as celebrates its moving into the modern era, both physically and socially, as a center for equality and the future. La Brea Affordable Housing The La Brea Affordable Housing project is a mixed use affordable housing project for formerly homeless LGBT youth, people living with disabilities and people living with HIV Aids. The 50,000 sq ft building is located one block north of Santa Monica Boulevard in the City of West Hollywood. The building maximizes density while allowing for ample outdoor space. 32 apartments are arranged around a shared exterior courtyard. The project was constructed through a nonprofit developer (West Hollywood Community Housing Corporation) to address an affordable housing shortage for tenants living with disabilities. Funding was provided by various sources including the City of West Hollywood, The County of Los Angeles and through tax credits. The mixed-use program brings higher density into the urban core of the city. Locating the project within the central urban fabric of the community ensures that residents have direct access to local businesses and services. 825 Warner Street SW - Atlanta, GA The site I have selected, 825 Warner Street SW in Atlanta, GA, sits in historic Adair Park, a neighborhood that is developing off the Atlanta Beltline Westside Trail. The lot sits on a network of opportunities that are crucial to the proposed project. Bordering the Atlanta Westside Beltline, this lot is accessible by both bike and foot. its close relation to Murphy Avenue allows it to be easily accessible for vehicular traffic, and its proximity to the West End Marta Station makes it accessible by Atlanta’s public transportation via MARTA. The area surrounding 825 Warner Street has been proposed as a mixed use area, with increased public transportation methods and plans to convert Allene Avenue SW into a “complete street” that provides safe access for all forms of traffic. Part of the proposed program for this center is a commercial health food vendor, and as this area is a classified food desert for the surrounding neighborhoods, the demand for healthy food options within walking distance is high. Existing Conditions The site is currently highly underutilized; about half of the square footage is paved over, and the existing building sits in the center of the site. This placement does not allow the building to take advantage of or account for the grade change from west to east, which is large enough to provide adequate height a basement level, being about a 12â&#x20AC;&#x2122; difference in height. The lot itself is large: about 155,000 total square feet, approximately 285 feet wide by 543 feet long. Existing Conditions (continued) The site sits on the intersection of Warner Street SW and Allene Avenue SW, a corner lot that provides direct access to the Atlanta Beltline Westside Trail. Vegetation around the area is abundant, but the pedestrian infrastructure is poorly maintained and a large portion of the site is paved over and enclosed in barbed wire. The existing building on site is an art complex that hosts various art events, that promotes safe, inclusive spaces for the LGBTQ+ community. Community Context Adair Park by majority a historic, residential neighborhood. There is a severe lack of healthy food options in the area that are walkable. This classifies the area as a food desert, and marks the area in need for food options for the surrounding residents. In accordance to walkscore.com, the neighborhood is currently highly bikeable, and the transit score is fairly high as well. The walk score needs improvement, despite being a fairly flat area for pedestrians. With the introduction of the proposed complete street on Allene Avenue, these scores would be improved greatly in all areas. Short Term Emergency Housing The term “coming out” to some LGBTQ+ youth is something they live in fear of for a huge part of their lives. To some, revealing themselves as LGBTQ+ means disownment from their families. To some, it means being kicked out onto the streets. To others, it means being mentally or physically abused. These cases, although extremely unfortunate, are very real, and those affected by this need a space where they know they will be protected for a period of time. This program would be a shelter inside of the center that provides a place to sleep, first-aid, and counseling to the youth who do not feel safe in their own homes. Long Term Affordable Housing For the members of the LGBTQ+ community who are able to support themselves, a long term, affordable housing option would be available. These residents would pay low rent for the area, while in return contributing to the center in some way. Working in the restaurant, creating art for the artist’s center, or leading LGBTQ+ events and meetings are some ways in which these residents could contribute to the upkeep of the facility and maintain a low rent. Commercial In combination with affordable building strategies to create affordable housing, I am proposing a secondary source of revenue for the center, that helps fund events and outreach to the community, as well as reduce the cost of long term housing, and fund the resources necessary to support the short term emergency housing. This commercial center would be the main attraction for outsiders who are not involved in the LGBTQ+ community to come to the center, while still exposing them to the centerâ&#x20AC;&#x2122;s roots. A restaurant facing the beltline that is owned and managed by the LGBTQ+ facility could be a potential business opportunity that serves both the neighborhoodsâ&#x20AC;&#x2122; needs and provides revenue for the center. This restaurant would provide healthy food options for the residents of the neighborhood as well as Beltline users. In addition to a restaurant, a redesigned art center would replace the existing program on the site, providing a space for artists to thrive and sell their work at and host events, while a percentage of these profits goes towards the LGBTQ+ center. Education The space would facilitate a space for community involvement and seminars on current LGBTQ+ initiatives, as well as provide a space for those who are unfamiliar with or do not understand the community to come and learn about what the challenges they face. Minors in the community would be able to bring their families here as a resource to learn more about what their child is going through, and what they can do to better understand and care for them. Bibliography Cianciotto, Jason, and Sean Cahill. LGBT Youth in America’s Schools. University of Michigan Press, 2012.http://search. ebscohost.com.proxy.kennesaw.edu/login.aspx?direct=tr ue&db=cat06545a&AN=ken.995869873902954&site=edslive&scope=site. Jones, Rebecca L., and Richard Ward. 2010. LGBT Issues: Looking Beyond Categories. Policy and Practice in Health and Social Care. Edinburgh: Dunedin Academic Press Limited. http://search.ebscohost.com.proxy.kennesaw.edu/ login.aspx?direct=true&db=nlebk&AN=380352&site=edslive&scope=site. Smalley, K. Bryant, Jacob C. Warren, and K. Nikki Barefoot. 2018. LGBT Health : Meeting the Needs of Gender and Sexual Minorities. New York: Springer Publishing Company. http:// search.ebscohost.com.proxy.kennesaw.edu/login.aspx?direc t=true&db=nlebk&AN=1616223&site=eds-live&scope=site. Raboin, Thibaut. 2016. Discourses on LGBT Asylum in the UK : Constructing a Queer Haven. Manchester: Manchester University Press. http://search.ebscohost.com.proxy. kennesaw.edu/login.aspx?direct=true&db=nlebk&AN=14699 45&site=eds-live&scope=site.